Unfortunately, after being released from jail by the state, the two men were immediately arrested by federal Drug Enforcement Agents who were waiting at the door! So we again had to go back to court to show that the questioning which led to the search was illegal – which we did, and the men were finally acquitted of all charges. Arrested with 264 pounds of marijuana, and they walked out the door of the courthouse as free men – no record, no probation, no prison time. 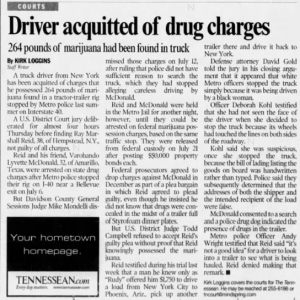 What this case ultimately hinged upon was a violation of the truckers 4th Amendment rights, which prohibits illegal search and seizure. When the tractor trailer was initially pulled over, the police officer cited the men for reckless driving – at that point, the men should have been free to go. Instead, the officer began questioning the men about what they were hauling, and declared that it was suspicious that their “bill of laden” (the list of what was in the truck) was handwritten, as opposed to being typed. We convinced the General Sessions Court judge in Nashville that the officer violated the truckers rights by detaining them longer than necessary to issue the citation, and then convinced a federal jury of the same thing six months later. If you are arrested in Tennessee with marijuana or any other type drug in your car, it is imperative that you contact an experienced criminal defense attorney who can ensure your rights are not violated, craft an aggressive defense, and go on the offensive to demand justice for you.